Fifteen years of dedication and hard work in the gym have paid off for Dalhousie student Alex Watters. 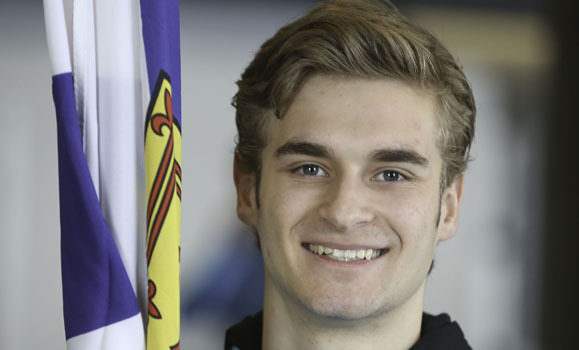 Not only will Alex be competing as a gymnast in the Canada Winter Games this month, but he has also been selected to be flag bearer for Team Nova Scotia. Between being a first-year Engineering student and training at the gym for roughly 20 hours a week, Alex is busier than the average 18-year-old. Even more impressive for his age, this will be Alex’s second time competing in the Canada games, as he participated in the 2015 Canada Winter Games at only 14. Alex explains that the Canada Games are one of his favourite competitions to participate in because they are so fun and foster a sense of community amongst gymnasts, creating a unique team atmosphere. Alex was training when his coach informed him that he had been chosen to be the flag bearer for Nova Scotia at this year’s games. “It’s all I thought about for the rest of the training,” he says. From the community of Williamswood, in HRM, Alex is proudly representing his home province at the competition. Alex chose Dal for its Engineering program as well as its proximity to home, where he still lives. Dal has also enabled Alex to continue pursuing his athletic goals and training at his gym, the Halifax Alta Gymnastics Club. Similar to the Olympics, the Canada Games switch off between winter and summer every two years. This year, the competition is being held in Red Deer, Alberta from Feb. 15 — March 3. Lucky for Alex, the Winter Canada Games and reading week at Dal have a partial overlap this year, so he can take a break from school and focus on his sport while some of the competition’s events take place.